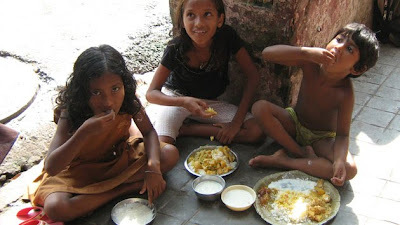 On September 21 2,000 children from the street schools of Calcutta and the villages of the Sunderbans were fed a sumptous meal in honor of Baba's mother, who recently passed. 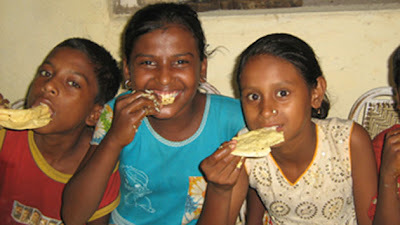 The children were delighted to receive this gift, and were happier than ever. 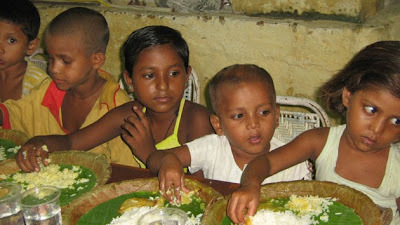 Baba and Maa served some of the children with their own hands. Baba's Mother, who was popularly known to all the devotees as Bani Ma, taught Baba the highest principle of Service to humanity as service to God. She was the very embodiment of love and compassion and showered everyone who came to her with the abundance of prayers and blessings. All through her life she was very joyful, and made everyone very happy in her presence with all her inimitable sense of humor. 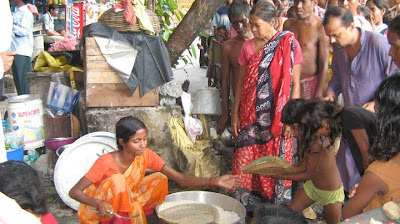 The devotees of Lokenath Divine Life Mission paid their richest tribute to to her eternal soul by feeding thousands of children and destitute living on the streets of Calcutta and the villages with sumptuous food. Baba spoke at several other venues when he was in the US. One of this messages wherever we went is: we all have thought attacks that lead to heart attacks. We are always unconsciously thinking, thinking, thinking. This makes our cellular bodies unhappy and leads to stress which creates heart attacks. If we dwell on the body we purge it of its impurities. He told the audience that we all tend to look for gifts from God rather than worshipping God and giving God gratitude for what we already have. Humans are restless and are always asking “What next?” We engage in materialistic pursuits versus spending time with God. Our exerting mind is always over-reactive and worried about what we have to do, do, do. We were never taught to relax without external props, material things. Meditation is being conscious of what you have. Count the Gifts from God before you surrender. When you find the inter-connection between you and the Divine, God dawns in you. God will chase after you. Worship the Divine of your heart. Then open yourself to the Lord, say “I surrender”. 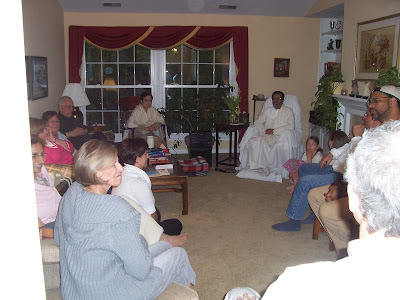 Baba visits the Circle of Compassion Meditation Group in Naperville, IL, USA. He also visited the Hindu Temple in Wisconsin USA and several other venues. All were blessed by his presentations. Seldom has the city of Kolkata experienced such a chilling winter. Braving the fearsome cold weather Baba and two mission volunteers recently set out to distribute hundreds of warm woolen blankets to the numerous, forgotten homeless destitute who don’t even possess a square piece of cloth to shield themselves from the coldness. 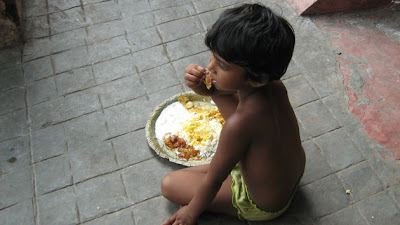 Every individual is dear to them, be it rich or poor, irrespective of cast creed or religion. Tonight Baba has no specific destination in mind. 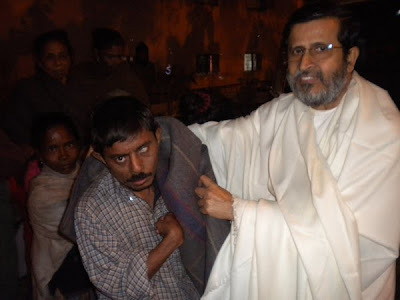 As the car makes its way through the alleys and by lanes of south Kolkata he notices a number of homeless beggars who have made the pavement their temporary abode, all crinkled up, and partially covered with thin pieces of cloth. Baba gets out and with care he wraps every single one of them with warm woolen blankets. This act of benevolence seems more like an offering to god than charity. 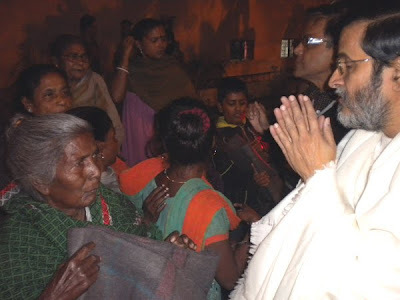 All the poor homeless souls bow down in admiration and gratefulness for Baba’s gift to them. The whole affair seems to be an exchange of love and respect, taking place…in silence…in the cold of the winter night…whiles the whole city remains in a deep slumber.The night was becoming darker and colder. However Baba kept on moving forward and giving away blankets be it a wrinkled old man or a small handicapped boy……his service was towards humanity. Hence it was same for one and all. A child and its mother were tucked away under a thin cloth at the corner of a street under the magnificent deep blue sky, though the wind is blowing fiercely. With love and care Baba covers them with a blanket. The mother opens her eyes in gratitude, speechless. Baba’s work was not over yet. He keeps on walking and serving numerous homeless souls. Three small boys were sleeping alone with a thin blanket covering all three of them. 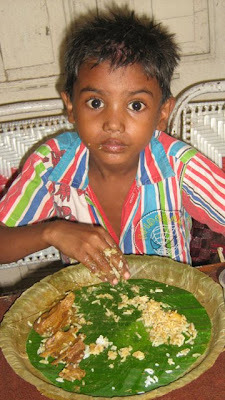 Baba wraps them carefully with the thick woolen. They will sleep comfortably for the rest of the night, waking in the morning to find a beautiful present of love and warmth. My heart bleeds with pain for those who have lost their lives in the Haiti Earth Quake and those who are struggling for little breath from under the debris of the destruction. This is the time when every one of us have the opportunity to open our heart in prayer and send forth positive healing vibrations and financial support to those who are in dire need of funds. All of us from Feeling Hearts join our souls together and invoke the Higher Soul to help and heal the suffering people of this natural disaster.